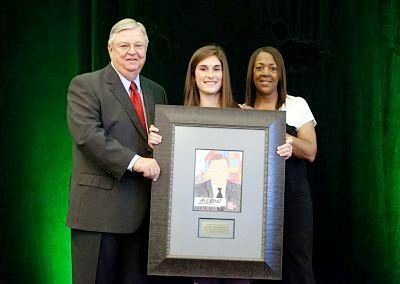 Economics Arkansas honored three eminent Arkansas businessmen with the 2017 Leadership in Free Enterprise (LIFE) award during a gala luncheon at the Little Rock Marriott on April 20. The awards recognized Don Munro of Munro & Co., Inc. in Hot Springs; Charles Nabholz of Nabholz Construction in Conway, and Robert A. Young III, retired, of ArcBest Corporation in Fort Smith. We invite you to view photos and videos here. Charles Nabholz was instrumental in expanding the family business into Arkansas’s largest commercial construction company, with offices in four other states. The company has won numerous awards and prides itself for its commitment to integrity and top-quality workmanship and service. 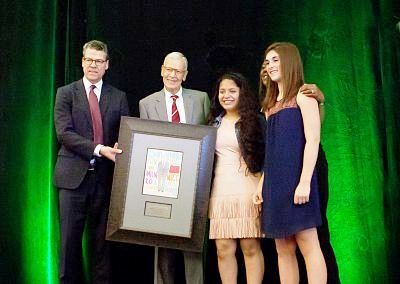 Don Munro established Munro & Co. in 1974 and successfully led the company through decades of upheavals in the apparel and footwear retail industry. Today, as only one percent of shoes are still being produced in the U.S., Munro & Co. is among the few US companies that manufacture most or a significant portion of their goods stateside. Robert Young retired from ArcBest Corp. in 2016 after a 50+ -year career with the company that included top executive positions. His leadership characterized by deep industry knowledge and commitment to doing the right thing has played a pivotal role in expanding the business beyond its regional roots to become a premier provider of transportation services across the country. All three honorees are also respected philanthropists whose generous support benefits many causes. 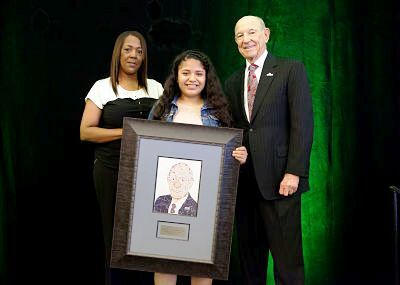 The artwork for the LIFE awards was created by Rosa Galindo, Kasey Dumas and Aubrey Marx of Barton Jr. High School, El Dorado School District. Also presenting during the event were several teachers and students who discussed the impact of economic and personal finance education on their lives and choices for the future. These included Linda Haley, a long-time, now retired Master Economics Teacher from the Rogers School District, and four fifth-graders from Stephens Elementary School, Little Rock School District. Almost 500 guests attended the luncheon, including major business and civic leaders.